Lowe's Girls win the Treble! 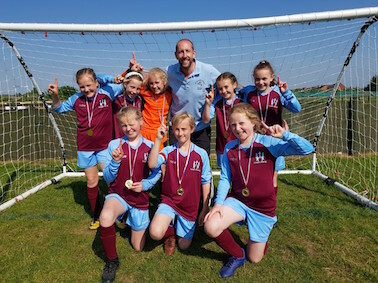 Lowe's Wong Junior School's Girls' football team recently faced their third competition of the year - the Newark and Sherwood District Spring Tournament. After qualifying from the group stages without conceding a goal, Lowe's Wong faced Sir Donald Bailey who have been formidable opponents this year. The Southwell team had the better of the chances but couldn't break the dead lock in normal or extra time. Penalties! Bravely, the girls executed their spot-kicks brilliantly and advanced to the final where they faced Chuter Ede. The girls played some of their best football of the season in the final and ran out comfortable winners with a 2-0 score line. The class of 2017/18 have won the treble this year and we are incredibly proud of them.